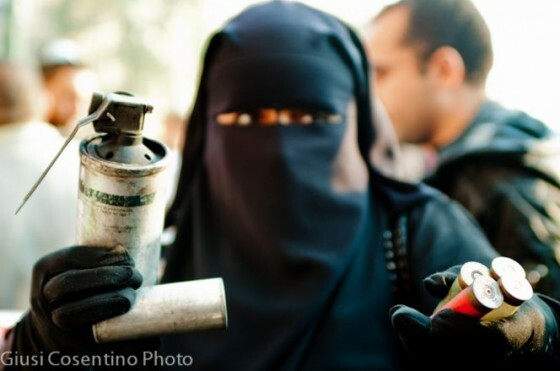 Sicilian photographer Giusi Cosentino has shared striking images straight from the heart of Tahrir Square. Sicilian photographer Giusi Cosentino and her partner Alex Tricani were commissioned to document life in Cairo in order to boost tourism. Fate pushed us together a couple of weeks ago when our bus to the Siwa oasis near Libya broke down, and we subsequently traveled together to meet the Veiled Weavers of Siwa and the One-Eyed Salt Carver who still loves his craft. Convincing the world that Cairo is a good place to visit is becoming increasingly difficult for the pair. Protestors are camped out for the sixth day at Tahrir Square to rebel against the country’s rogue military, which has responded with a potentially lethal brand of tear gas, rubber bullets, and live ammunition. Nothing brings a story home better than beautiful images, so Giusi has shared hers with us. Please visit her remarkable Manifestanti in Piazza Tahrir photo gallery for an up-close look at what our Egyptian friends are currently facing. let me tell you, you have hit the naiil on the head. The issue is something which not enough people arre speaking intelligently about.